Our most popular quality is definitely Royal Grass Silk35. 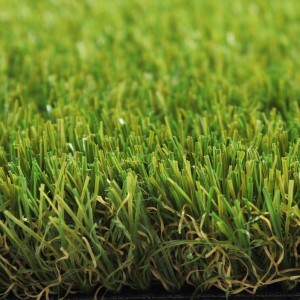 There is no doubt that this type of artificial grass is a wonderfully soft one and looks very dense and inviting. This what we think grass is meant to be like. Children love playing on it and pets alike. It’s very nice to walk on bare feet and will make you garden or balcony incredible. This, combined with a good price, won over many thousands of people who discovered that Royal Grass really is the most natural looking synthetic grass on the market. We dare to say it’s as good as natural grass, but with a lot more advantages! We continually innovate to improve our products to make it look and feel indistinguishable from real grass. Many people choose Silk35 because of its soft feel, full and natural look. Royal Grass is friendly for children and animals, environmentally safe with respect for nature. 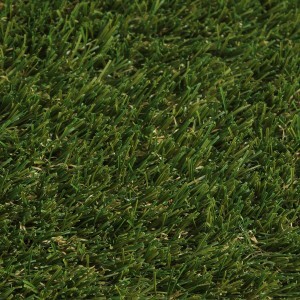 Royal Grass Silk35 has 35 mm tall, fresh green and olive green grass fibres. This gives the grass a summery look, inviting you to sit down and relax, enjoy your garden to the fullest. 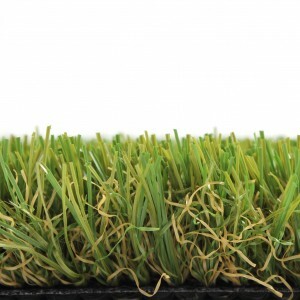 The lighter brown rootzone in between the grass fibres, gives the artificial grass an even more natural look. If you ask us which is the most popular product, we will definitely stat that it’s this one. But, you might have a different opinion and also your garden design should be taken into consideration.